Customer Service: Water Hammer: What is it & How to Avoid it? The sound of a loud, abrupt knocking or booming vibration of the piping is caused by an immediate increase in pressure from the liquid either changing direction or velocity. There are many common causes of a water hammer. First, being when a valve is opened or closed too quickly. This creates shockwaves that move back and forth through the pipes. The waves move backward until they hit a solid obstacle, then forward to the next obstacle and repeat until the pressure is equalized. Other situations include the movement of air pockets in a pipe, in which air is compressed in low spots and carried through the pipeline and expand in high spots, causing pressure variation. A quick pump startup can also cause a water hammer by inducing the collapse of an empty space downstream. If left unresolved a water hammer can cause damage to the pipeline and other components. 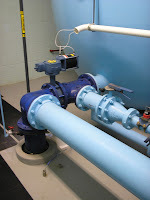 Solutions to control a water hammer include: locating the source, appropriate startup and shutdown procedures, adjusting speed control valves, the installation of pressure relief valves and air release valves and the use of equipment such as air chambers or expansion tanks.